Mennonite Heritage Tour (Last of 8). In a room above the Black Madonna shrine at Jasna Gora, Czestochawa (Poland), I was startled by probably the homeliest Jesus I have ever seen. 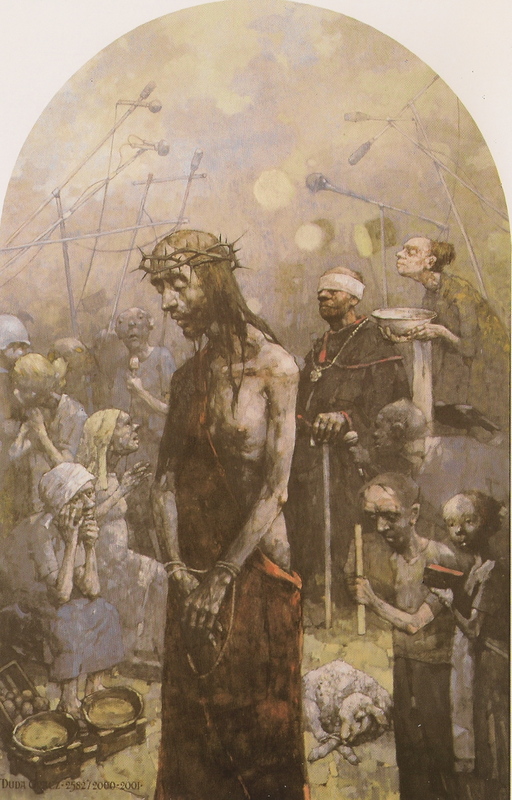 He appears there in a series of 18 remarkable Stations of the Cross paintings by Jerzy Duda Gracz. Here the incarnation of God is truly of “no form or comeliness…no beauty that we should desire him” (Isaiah 53:2). These paintings formed a kind of spiritual backdrop for our next stop, a sobering visit to Auschwitz-Birkenau. 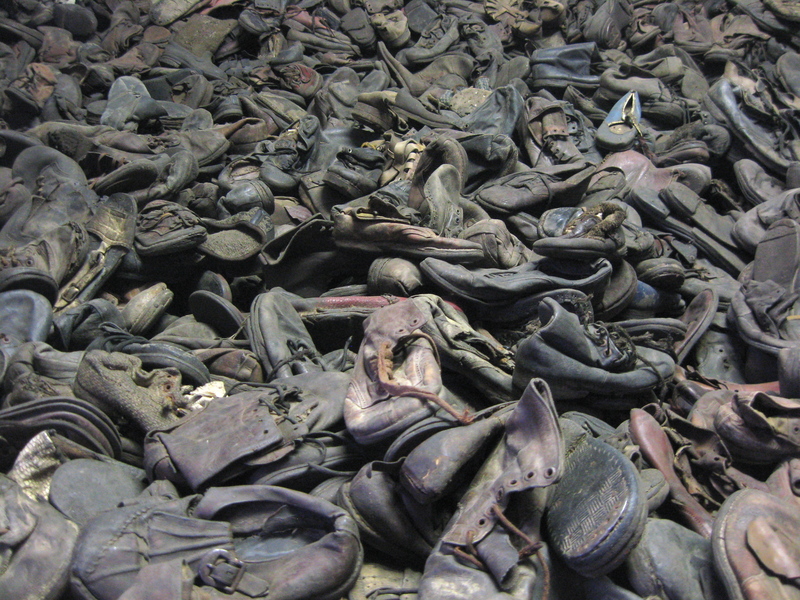 How does one begin to comprehend the suffering memorialized here? The numbers overwhelm, the piles of shoes and hair and suitcases overwhelm, the rows of sheds that housed the camp’s prisoners overwhelm. Don’t think of the millions, someone said to me. Think of one, and one, and one. Yes, but “one” will not hold still. When I tried to take a photo of “one” woman, my clumsy photography attempts were a symbol of the impossible. Here in the “one” were the reflections of more images opposite (see left). It is, in truth, the many that I had to confront. I looked at these beautiful women’s faces and the fact of millions pushed its way into them, and they all grew thin and grotesque with the evil that was done upon them. At the same time I kept seeing One — Jesus with the likeness of a Gracz painting, collapsing in a tangle of bodies as poison from a capsule filled the chamber, his hair tossed on the huge piles of hair used for mattresses and the like, his shoes tossed onto the mountain of old and unnecessary shoes. 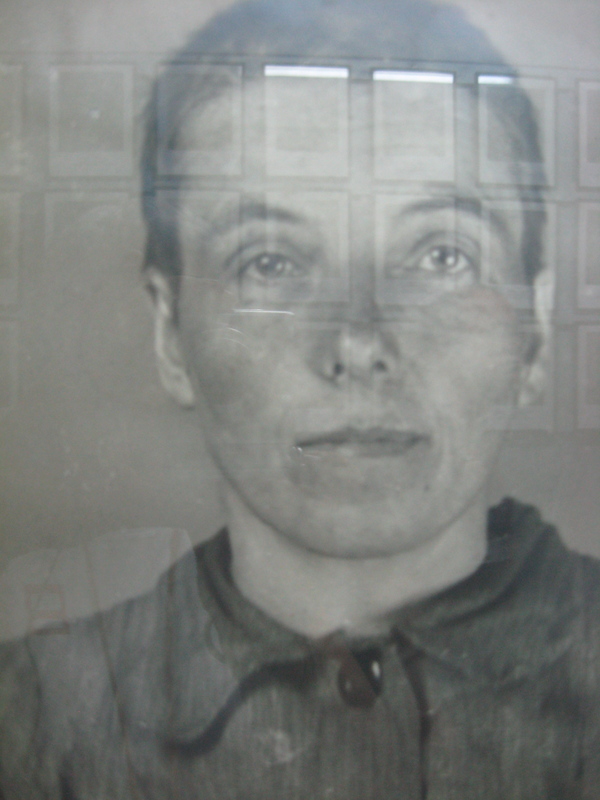 This entry was posted in Personal, Women's lives and tagged Auschwitz-Birkenau, Jasna Gora, Jerzy Duda Gracz, Stations of the Cross, suffering by doradueck. Bookmark the permalink. Thanks, Dora, this is powerful.